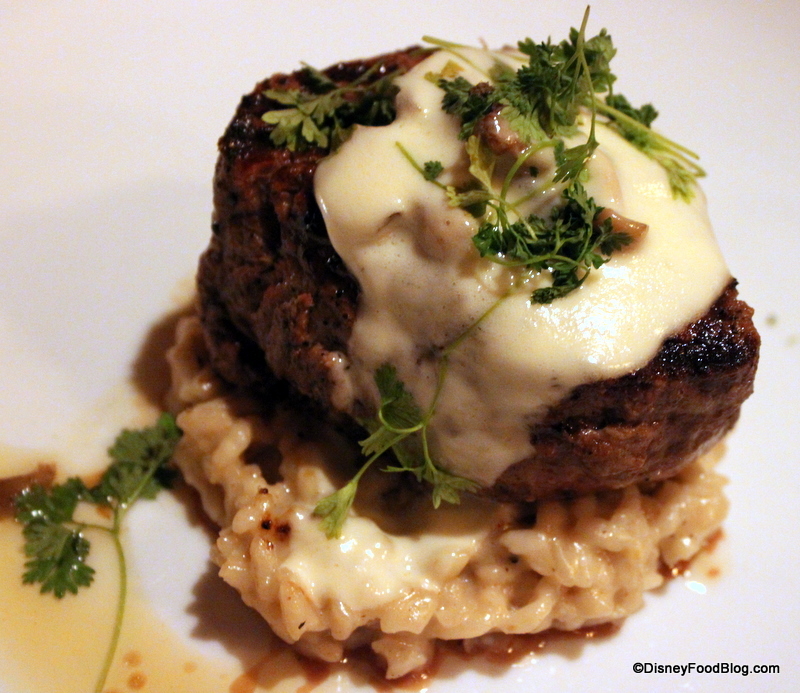 Time to revisit a fan and Disney Food Blog Favorite: Le Cellier Steakhouse in Epcot’s Canada Pavilion! 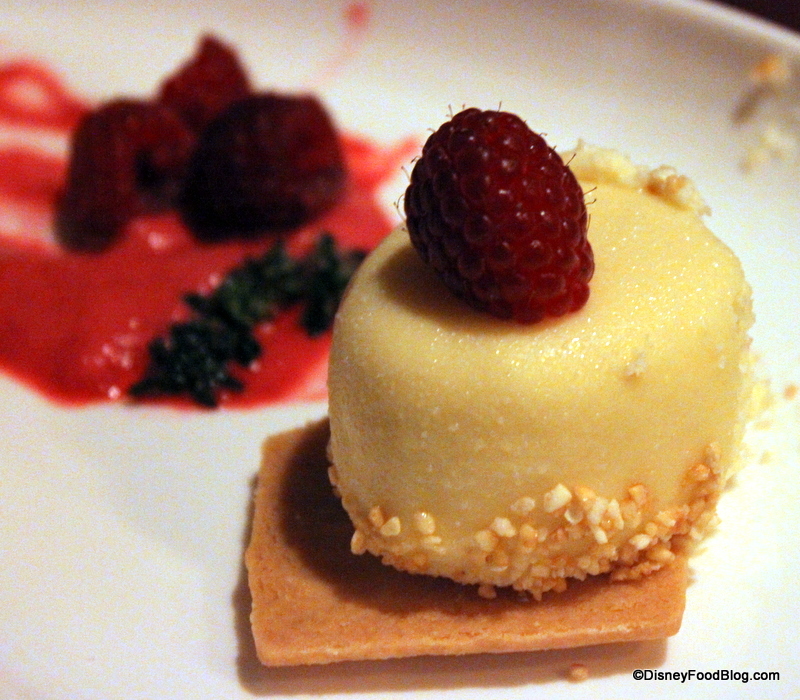 You’ll remember that we visited Le Cellier last March for dinner, just after Le Cellier dinner became a signature meal on the Disney Dining Plan (meaning it now will cost you two table service credits to dine there, rather than one). At that time, we were focused on whether the menu could really deliver an experience that was significantly different than it had been before, and whether dinner would be worth the much higher prices than you’ll find at lunch. We walked away somewhat let down by the meal — especially disappointing was the ribeye with maple butter, a flavor combo that just seemed all wrong — but we were confident that they would pull it together. We also wondered right along with you if lunch would also become a signature meal, and if dinner would continue to be a signature meal. Fast forward a year from that first signature dinner! It’s time to see what, if any, evolution has taken place! In the year since we last visited, only two real changes have taken place in the dining room during the Signature dinner meal. Remember those snazzy little maple leaf napkin rings that I told you about last year? Those are gone from the tables, as are the table votive candles and their pretty little holders. If I had to guess why, I would figure that they were so cute, they proved to be irresistible to snag as a souvenir. 😉 But that same upscale, wine cellar feeling with arches, candlelight sconces, deep reds, and dark woods throughout still signal that you are someplace lovely, cozy, and probably surrounded by snow. As you can see, the lack of table candles and napkin rings makes dinner pretty indistinguishable from the lunch setting. After we were seated, our server, Gabby, greeted us cheerfully. She was wonderful from the get go! We learned that she was on her second Le Cellier tour with the International Program, and she proved to be helpful and knowledgeable as we made our choices. Of course, we started with a few drinks. 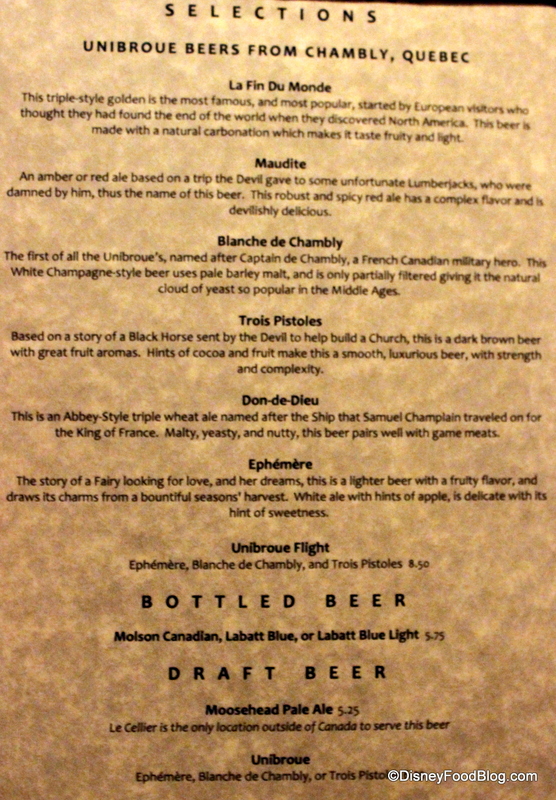 First up: the the Unibroue Beer Flight, which features three distinctly different beers made by the Quebecois brewery and available on tap: Ephémère, a white ale with hints of apple; Blanche de Chambly, a champagne-style beer that’s only partially filtered; and Trois Pistoles, the darkest and most complex of the samples. He enjoyed all of the selections. On the way in, I noticed this Champagne Flight and snapped a photo for you. 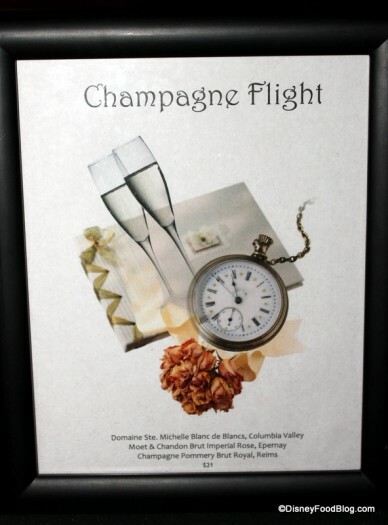 But in the end, I utterly forgot to order said Champagne Flight, and opted for another awesome option! 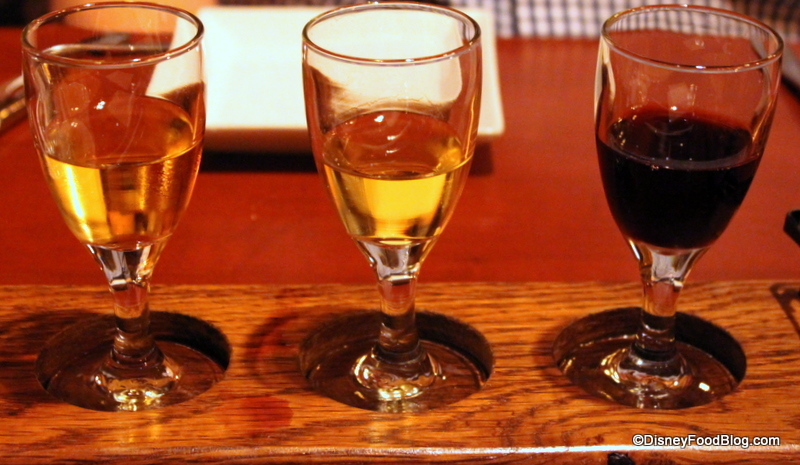 Ice Wine Flight! If you aren’t familiar with ice wine, it’s a dessert wine made from grapes that have actually frozen on the vine, thus concentrating and intensifying the sweetness of the juice that is pressed from the grapes (or other fruit). 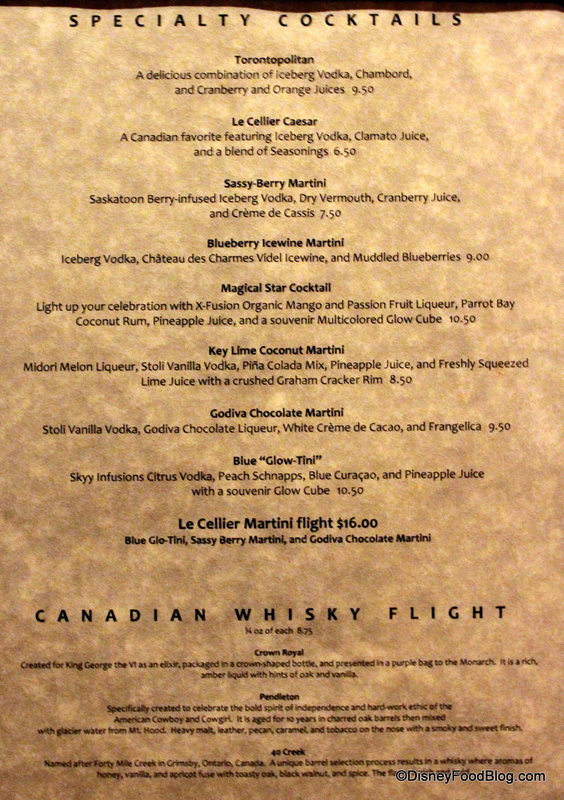 The flight consisted of a wonderfully diverse trio: the Neige Premium Apple, the more widely available Inniskillin Vidal, and the red Meeker FroZin. All of the wines were sweety-good, but my heart will always be with that standard Vidal! On to a few of the real eats! As we noted in our lunch review last October, the tall bread “vase” has been replaced by a bread basket, and while you still have the pretzel bread sticks, the other sourdough and multigrain bread offerings have morphed into rolls. No worries, though — the pretzel bread is still just as good as it always has been! Now, of course I couldn’t help but order one (two) of my favorite thing (things) in all of Disney World — Le Cellier’s dinner “Poutine”! 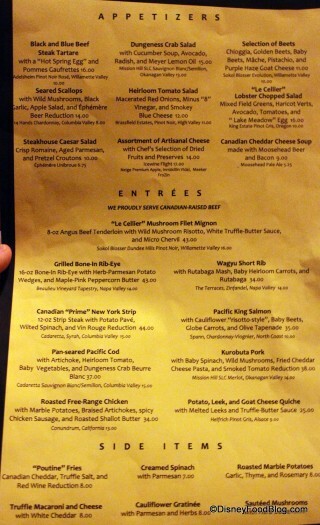 You’ll notice that “poutine” appears in quotes on the menu. That’s because if you ask any self-respecting Canadian what poutine is, this will not be it. Normally, the thick, french-fried potatoes are covered with big, white cheddar cheese curds and a brown gravy to boot. It’s bar food at its finest. Here, the dish is a more refined iteration, even from the lunch version. The dinner “Poutine” includes hand-cut fries, sharp (but small) Black Diamond cheddar cheese curds, and, in lieu of a gravy, a red wine reduction. It’s the perfect balance of savory, salty, and tangy. See those two “Poutines”? They were supposed to be shared among the four people at the table. Guess who polished off the lion’s share? They were SO amazingly good. No, really. This is the stuff that potato fantasies are MADE of. And if you ever find that you have Le Cellier Dinner Poutine leftovers, you know who to call. We also ordered the Artisinal Cheeses as an appetizer. You can find these on the dessert menu, too! I’m finding more and more that I’m enjoying all of the cheeses, not just the mild ones, on the cheese plates — which I guess means that I’m expanding my palate (or Disney is using blander cheeses). As is the Disney norm, this plate consists of cheeses that range in flavor and consistency. 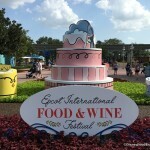 One of my favorite touches for the Disney cheese offerings? Honey pairings! 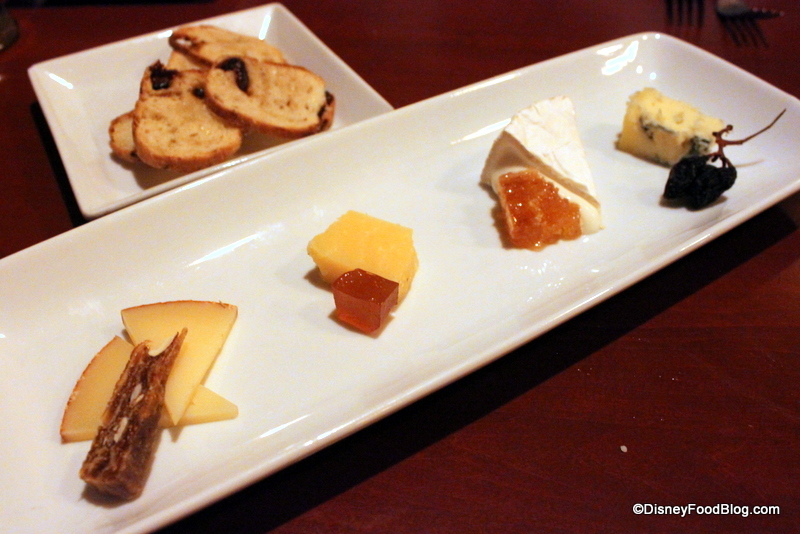 Here, the honey was specifically paired with the brie, but I really enjoyed it with all of the cheeses. Every one of them was delicious — even the bleu wasn’t too heavy for my taste buds. As we told you in March, both the lunch and dinner menus have undergone changes since launching as a signature dining spot for dinner. We highlighted the menu changes for the lunch menu previously, but let’s take a look at what’s changed on the dinner menu. Where some entrees have remained on the menu, a few of the accompaniments have changed as well. And now it’s time to dig into some entrees! After the disappointment of sweet maple butter on an otherwise incredible bone-in ribeye last March, I decided that I would have my absolute favorite this time as to avoid any more disappointments — the Mushroom Filet. As it is so incredibly good, and everyone around the table knew I wouldn’t share, two of them wisely ordered their own! Cooked to perfection with a melt-in-your-mouth texture, the filet is served on a bed of creamy wild mushroom risotto, with a savory truffle butter sauce and micro chervil bringing a little fresh color to the plate. I love this risotto SO much that I usually order extra. My dad was the lone filet dissenter (thankfully, for variety’s sake) and went with the Canadian “Prime” New York Strip, which came with a potato pavé, wilted spinach, and a vin rouge reduction. The potato pavé was basically a fancied-up gratin, consisting of thinly-cut potatoes fused together with all manner of cream, butter, and cheese. Dad rated the meal top-notch. After we got over the bliss of all that beautiful Canadian beef and potato, it was time for dessert. 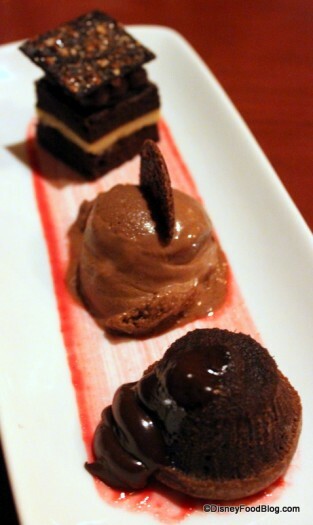 1) See that darling lava cake? You would think there would be a liquid chocolate center. Not so. The lava was outside of the cake only, as though it had been supplied at plating time. That was a little confusing. 2) The other issue with this dessert sampler is the “Nanaimo” bar. Nanaimo bars, like poutine, can start riots if they are not properly termed. Normally, a Nanaimo bar is all manner of yummy, rich things thrown together — a no-bake cookie crust, a thick vanilla-butter “icing-like” center, and a covering of melted chocolate. This is not that. Gabby, our wonderful server, agreed with our suspicions, confirming that this “Nanaimo” bar really was just a little piece of chocolate cake. Sigh. Not BAD, but not a Nanaimo bar. 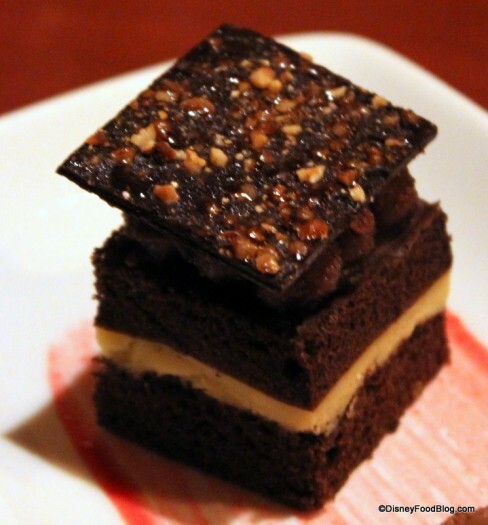 Here’s a picture of the non Nanaimo “Nanaimo” Bar. You may be tired of hearing raves and applause for Le Cellier, but it remains one of the most consistently fantastic dining spots for us in Walt Disney World (and we eat at a lot of Disney World restaurants… a LOT). And that, my friends, is why I will continue to fight for a reservation at this lovely dining spot in the heart of Epcot. What has been your impression of Le Cellier through the years? Have you had as good an experience as we have? Share your thoughts and opinions with us below! 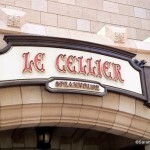 I went to Le Cellier for the first time this January for lunch on the dining plan. I am so glad we had the opportunity, because it was really an amazing meal (even for a vegetarian!). My only regret is that I had but one stomach to fill – between the awesome strawberry smoothie, pretzel breadsticks, prefix menu with salad, a gnocchi dish, and maple creme brulee, and an additional order of poutine (we also could not resist), I was in a food coma the rest of the day. I’m glad to hear that things have gotten better, my last meal at Le Cellier, right after they changed to Signature Dining, was awful. Also at Le Cellier, by request as I believe it is not listed on the dessert menu, is still the “Moose” for dessert. We dined there in April and the kids were disappointed it was no longer listed on the menu, but we were able to order it. After trying for years to get a reservation, we were finally able to dine at LeCellier in February; we probably won’t go back as it was such a disappointment. The service was terrible, the steaks were overcooked, and the desserts just weren’t good — didn’t live up to the hype at all. It may have just been a bad night for them, but there are too many other signature restaurants that ALWAYS deliver for us to want to try LeCellier again. I ate at Le Cellier in November. The food was ok but I didn’t think it was anything special. One of the biggest turn-offs for me was that it smelled like fish in the restaurant. It hit me as soon as we walked it. My friends want to go again this year. I will try for a ADR at Yachtsman Steakhouse. My mom loved Le Cellier until we ate at Yachtsman. Such a great experience. I like Le Cellier, but the truth is that all reviews basically praise the same thing – pretzel bread and the filet mignon. (And before the poutine it was the cheddar cheese soup, too.) Point being that the “steak” restaurant is generally highly praised for…not what it can do with steak. Yachtsman was on a whole other level – the steaks we ordered (not a filet mignon in sight at our table!) and sides were just AMAZING. 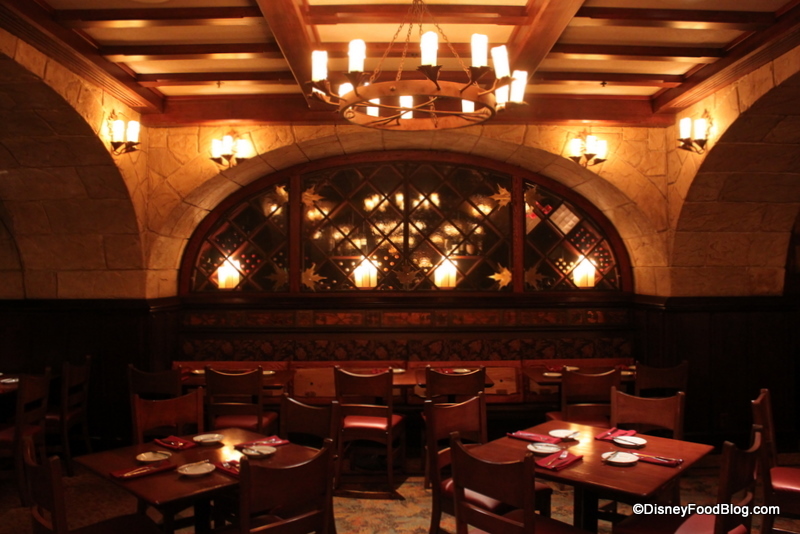 I loved the service and the less claustrophobic/rushed feeling* you get at Le Cellier. I have to agree with those that are not thrilled with Le Cellier. I have eaten there at least 4 times and I always wonder why did I go back? I think the tables are too close together, I hate sitting so close to someone that I need to turn sideways to sit down to squeeze between two tables. I will stick with Yachtsmans if we want a great steak dinner! I find those table settings to be unacceptable for such an expensive restaurant. Makes you remember it’s in a theme park. So glad to hear you enjoyed your meal there. I went for the first time in December and was fully prepared to be underwhelmed due to all the hype Le Cellier gets. My husband and I had a fabulous meal there, and our mouths are still watering over the mushroom filets, pretzel bread, and most surprisingly, the mussels. We are big mussels fans and the ones at Le Cellier were among the best we’ve had anywhere. I think the problem, I am gathering from most of the commentary, is due to the difficulty in upscaling to a signature restaurant. We are paying more in either cash or TS credits for an experience and cuisine that is only slightly different from our recent ones. Since the dining plan started we have, for the most part, had two levels of table service. We feel a signature meal should be almost twice as good, and many folks are not feeling this yet from this eatery. The reality probably is that existing signature restaurants are not twice as good as they would be if they were single credit places. Now, if you compare the signature places, including Le Cellier, to some of the “lesser” resort restaurants there is a difference. Maybe not twice as good, but better on the whole. My favorite steaks are at Shula’s @ the Dolphin and believe it or not, Flying Fish. I’m trying Le Cellier dinner for the first time since it went signature this fall. I’m going to try those poutine fries, they look like junk food at it’s finest. We have an ADR here on our upcoming trip, though it’s questionable whether it will stick for scheduling reasons. We have not eaten here in about 3 years because we recently have been going to Yachtsman for steak when on property. But I think it’s time to checkout our old favorite again. We first ate at Le Cellier on our honeymoon in 1999 before it became all the rage. We were literally just walking by, decided to walk up and see if a table was available, and it was! The meal blew us away and it quickly became a favorite for us. Sigh, I miss those days! 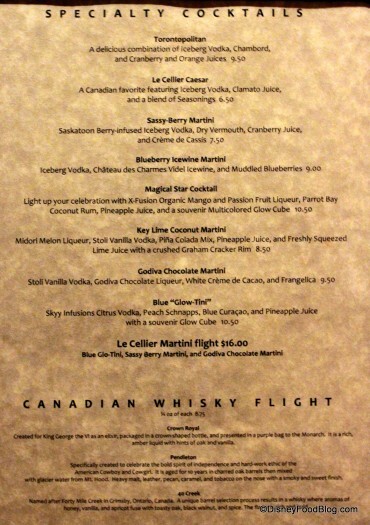 If you really want to try a typical Canadian drink try the Le Cellier Caesar. Caesars (or Bloody Caesars) are really popular up here in Canada, you can get one at just about every restaurant that sells alcohol and they sell them pre-made in bottles and cans at the liquour stores. If you go to Wikipedia you can read about the origins of the drink and there’s a recipe for it as well. This drink is a VERY Canadian drink and it’s very, very good! I’m glad you enjoyed your recent meal at LeCellier. Unfortunately, in recent years, I have been greatly underwhelmed there. When it was a 1 TC for dinner restaurant, I thought it was a great value and ate there many times over the years. The restaurant was ALWAYS busy. When they went to 1 TC for lunch and 2 TC for dinner, I assumed they wanted cut the number of dining plan customers for dinner (who typically had reserved every spot in the restaurant) to accomodate cash paying clientele. The last time I ate there, for dinner, I was horrified that they had done NOTHING to justify the bump in table credits they now charge for those of us on dining plan. For a 2 TC restaurant, the tables are MUCH too close, the service too hurried, and the food not particularly outstanding. My last meal there was SO BAD that my wife and I vowed that we would NEVER return, even for lunch. There are so many other places to get a good filet or steak (Yachtsman, Narcoosee’s, Artist Point, etc…) that there’s no reason to have to go to LeCellier *unless* you’re addicted to the soft pretzels they claim are “bread”. And even then, you can acquire a soft pretzel at the German pavillion, just a 10 minute walk away, as a snack credit. So, if you find yourself at Epcot craving a steak, take the boat leaving for the yacht club… You’ll thank yourself for it. @Laura: We had a terrible meal at Le Cellier in February too! 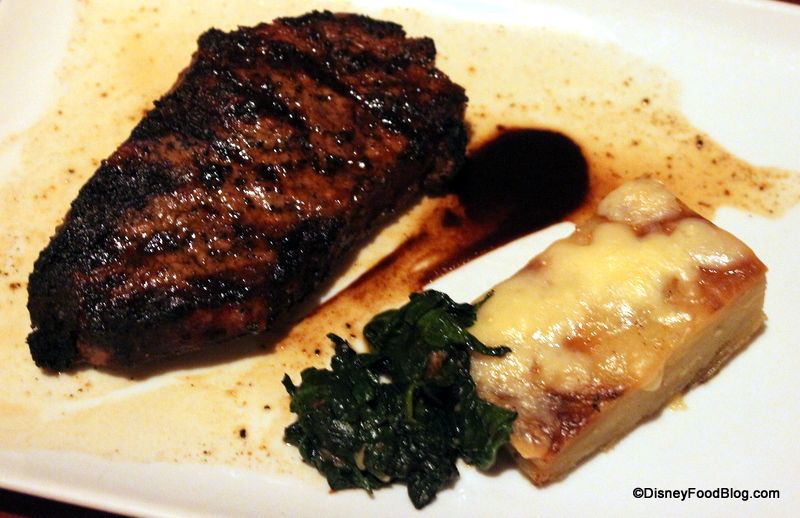 I wonder if it was an off month… Our $43 ribeye came plopped on a bare plate, all gristly and chewy. We actually sent the Parmesan fries back because they were so dry and flavorless. In exchange they brought us a lumpy pile of mashed potatoes that were literally nothing but boiled potatoes that had been mashed—no butter, no cream, no salt. Gack! Like others have mentioned, I keep being compelled to make reservations at Le Cellier just because it is the hot ticket to get, but I think this meal finally cured me of the need. We’ll stick with Yachtsman Steakhouse! We used to love Le Cellier but I fear they are reading too many of their press clippings. While the filets are amazing, the service is horrible. For the first time in over 100 meals, I demanded that the manager remove the auto 18% tip as we use TiW. The also gave us those potatoes with gravy and cheese (we love to eat and love fries) and we left over half of the plate, they were funky tasting. Overall, there are too many, excellent dining experiences for us to waste on Le Cellier, until they get their act together. Still don’t see how its been improved enough to warrant a “Signature” designation, which essentially doubles the price of the evening meal. Courtney — I couldn’t agree with you more. Thanks for the vegetarian perspective; that gnocchi sounds great! Heather — I’m sorry to hear that. Mine wasn’t all that great last year after the change, either. 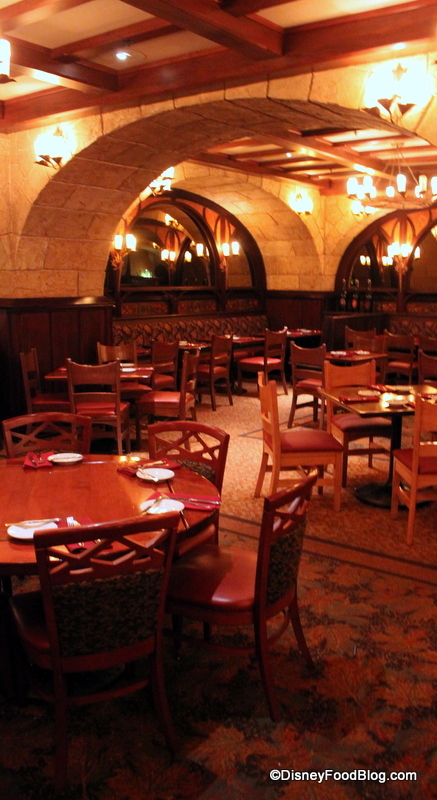 I think Le Cellier is a spot that does a few things very well…and maybe they shouldn’t stray from those. Pat — Thanks for the info that the Chocolate Moose is still available! JoAnn — Yikes; it smelled like fish? That would probably turn me off, too, in a steakhouse! Fueled — We like Yachtsman as well — and Shula’s across the lake at the Dolphin Resort. Both are excellent steakhouses! Kirsty — Thanks for your review and feedback! Elizabeth — Interesting take on that! I didn’t think of it that way, but it’s a good point. 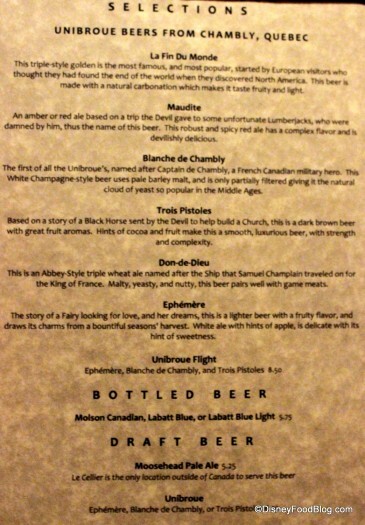 Betsy — Thanks for the review and for the recommendation on the mussels! Alan — That’s such a good point. You figure the service will be very similar, since it’s probably the same servers in there for lunch and dinner. Why would just changing the food make the restaurant experience more “upscale” or “twice as good.” Great thing to think about there. Frank — I LOVE the steak at Flying Fish. So delicious. Jennifer — Indeed! 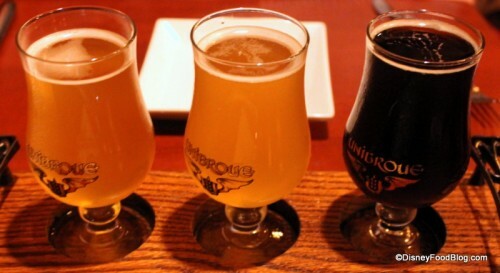 You can always go there just for drinks and appetizers to keep costs down! Shayne — I know! But with the new credit card guarantee, those walk-up days might be more available now… Can’t wait to hear what you think of Le Cellier when you guys go. Lisa — Thanks for the info!! Will have to try that! CraiginPA — Wow! That must have been one really bad dinner! 😉 Thanks for sharing your experience and opinion with us. It’s appreciated. Jim R. — Thanks for your feedback, Jim! Jeff — That seems to be the general feeling, I think. Thanks for your feedback! I have had two very good past experiences at LeCellier. Good service and I love the Fillet w/mushroom risotto. I’m going back for lunch (non-meal plan) in the fall. My question: Is the same (maybe slightly bigger) filet that costs $26 at lunch worth $43 at dinner? I just don’t see it, but would love to learn what I am missing. The lunch portion is more than enough for me, and given the price, I won’t go for dinner now. I am writing this from the heart of Orlando! :^D We will be in Epcot tomorrow, and am sorry I am not eating here after reading this. Poutines sound like my perfect food! I hope it’s all well prepared (it better be if it’s a signature meal). I’m disappointed in the general blandness of the new menu. Interesting items like Braised Oxtail Ravioli, Asparagus Gratinee, and Roasted Venison Medallions have been replaced by things you can get at a lot of places, like scallops, crab salad, and cod. I side with the unimpressed folks here. If you like Outback, you might think this is heaven, but if Shula’s is more your speed you’ll be quite disappointed. My $43 Rib-eye was what I’d expect from a chain restaurant, at about half that price. It was a lousy piece of beef, cooked poorly. Yes, the poutine was great, BUT it’s a steak house, not a fry shack. Would you say it is better than the lunch or the same? Can you ask for a side of the mushroom risotto for lunch? Without ordering the filet? I don’t eat meat but LOVE mushroom risotto. Ann – if it’s served at lunch, yes. We tried asking for a side of cream cheese mashed potatoes at dinner, but Le Cellier didn’t have any cuz they’re only served at lunch. My husband is from Quebec and when we went to Disney for Christmas of 09 we went to Le Cellier for lunch one day. We obviously ordered the “poutine” and of course we were very excited to have some, and then disappointed with the result. Looking at your picture I think we would have enjoyed that much better because our fries were these huge steak fries that didn’t fit. But I think if they keep it with the smaller “shoe sting” type, it would be much better. I can’t wait to go to Quebec this summer to have the real poutine…..
My husband and I also dined here for the first time in October 2011, not long after it bcame a signature. We were not overly impressed. It was good, no real complaints, just not as amazing as I had heard. The food was tasty, the service was good but we had a “new” server and she was slow and not very knowledgable but we gave her a break becuase everyone has to start somewhere. Maybe because we are from Canada we were expecting more?? 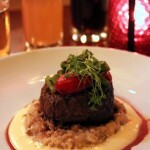 Saying all that, we just went to Artist Point in April 2012 and were swept off our feet with service and flavor! Will we try Le Cellier again? Maybe, but for 2 credits off the dining plan? Not anytime soon. Thanks for the review!! 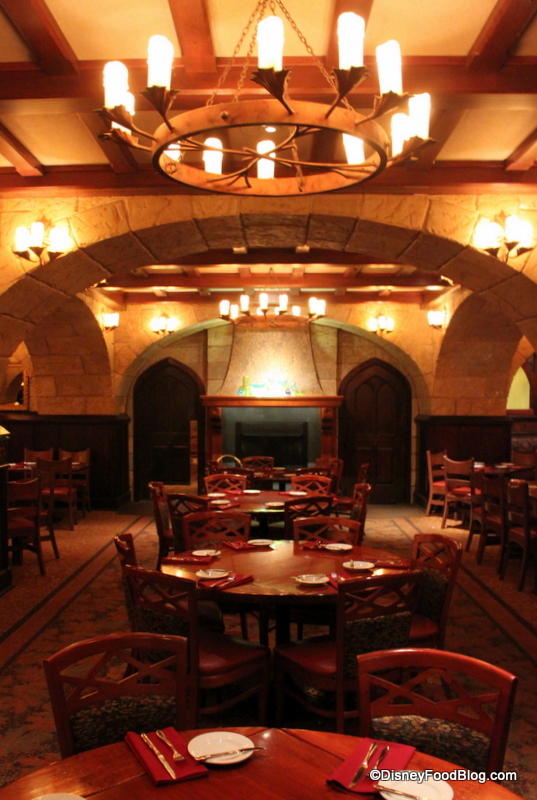 Le Cellier used to be a family favorite. Almost ten years in a row. However, since it has become a Signature restaurant, we do not like the changes made to our favorite meal. We ALWAYS ordered the Mushroom Filet, but we chose to get the Cream Cheese potatoes instead of the Mushroom Risotto. They still offer this meal as a Signature restaurant, but the taste is not the same at all. In fact, we have almost decided to find a new favorite due to such disappointment with the flavor change. Now, I’m not saying that it tasted bad. It was still very good, just not the same AT ALL. 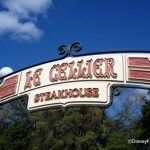 I wish Le Cellier would bring back the original Mushroom Filet!! 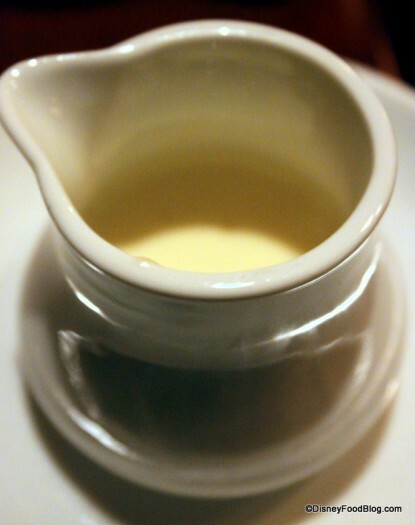 My husband and I recently dined at LeCellier and were disappointed with meal. My husband ordered the bone-in ribeye and was not interested in finishing his steak because it was so tough and lacking in any taste. I would almost question if it was even a true ribeye. I ordered the filet and while the meat was good, as I would expect from a filet, the risotto left a lot to be desired. Again, the risotto was bland and the mushrooms were tough, definitely not fresh mushrooms. The best part of the meal was the Putin fries. We will not be venturing back to Le Cellier. When comparing this restaurant to other 2 credit table service restaurants – I fail to see the appeal. I was excited about this meal after reading about it in multiple books and it failed to live up to the hype. We waited awhile for our table and were seated next to the kitchen door. Service was okay – not great. The filet mignon with mushroom risotto I had for dinner was good. We enjoyed the pretzel bread and even asked for more. However, my parents ordered the no sugar dessert and it was inedible. The restaurant was loud and the tables are close together. Bottom line – when comparing to other 2 table service credit meals (Jiko, Narcoosee’s, California Grill, Flying Fish Cafe) I would skip Le Cellier. It is not worth it! On my recent trip (September 2013) my husband and I dined here on one of our “date nights” where my in-laws so graciously watched our daughter. While the steaks were good, the cheddar cheese soup was incredible and the service was great, I’m not sure it was worth 2 table service credits. We were lucky enough to enjoy two nights out by ourselves, this meal was not as good as our dinner at La Hacienda, and that was only one table service credit. We had a later reservation, so the restaurant was quiet and the atmosphere was very pleasant, but I think if we are going to splurge and go the signature route, then we will probably skip this and try somewhere else next time around. Le Cellier is worth the time and the 2 dining credits. My husband and I were there for a celebration and it was divine! We had no wait to get in (make sure you do not come early…they seat on time). We had the BEST service in Emily and the food was cooked perfectly. The pretzel bread is to die for and the dinner was excellent! We took our desert to go and enjoyed it later on after the food coma was walked off. If you are looking for a great steakhouse…this is where you should go. It was small and quaint…but quite loud. Going into it knowing this is beneficial. Don’t expect candle lit and quiet… It is Disney and there are children. On Friday, January 24th, we were ready to enjoy our last day at Disney Parks. We had a reservation for lunch at Le Cellier in Epcot at 3:05pm with my wife and our 4-year old daughter. Our waitress was Lacy, and she was very nice and attentive. We ordered the veal chop and the NY strip steak. When my wife’s steak came out, it was charred and burnt on the top. Lacy acknowledged it was burnt, she apologized and said she will put an order in for another one. The veal chop came not very warm, after two bites and as I cut more into the chop it just became very tough and chewy, not what you would expect from such tender type of meat. I did not take any other bite and waited for Lacy. I showed Lacy how hard it was to cut the meat with the meat knife and she agreed as I tried to cut right through the middle of it. She apologized and kindly agreed to offer something different. I asked Lacy if I could order the pork belly instead. We were prepared to enjoy the rest of our meal. About 10 minutes later the Restaurant Guest Service Manager, Rick DeCicco, came to our table. We thought he was going to apologize for our lunch not being cooked properly the first time around. He said, “I understand you were not happy with your veal chop, even though you ate 94% of it.” This kind of shocked us, we thought he was joking, I laughed and asked him if he was joking, he said “ No I am not joking.” That surprised us enormously. First, it was absolutely not true and secondly, it is incredibly rude and not up to the “magical” standards of Disney. We could not believe we were subject of such treatment at a Disney Restaurant where you just don’t expect anything less than kind and respectful. At that point my wife asked Rick to please get our waitress, Lacy, because she did not want to communicate further with him. We were being treated this way in front of a room-full of customers and it was an incredibly uncomfortable situation, especially there with our 4-year old daughter (and my wife pregnant). Rick continued to press the issue, I requested to talk to his Manager, he stated he was the manager there and there was nobody else to talk to. My my wife left and I stayed behind to ask Rick for his card. I was holding my 4-year old daughter in my arms, and as Rick handed his card to me, I reminded him he works for Disney and he needs to be more respectful of customers. He then asked another restaurant staff to “call Security”. This is the part that upsets me the most and probably the most aggravating. I am not sure what he expected with me there with my 4-year old daughter in my arms. I can tell you I posed no threat to him and he continued to escalate a very unnecessary and embarrassing situation. I am sure that Rick DeCicco’s behavior this past Saturday is not the standard and example of a Guest Services Manager at Disney. That experience pretty much ruined the rest of our day at Epcot. I wish that had kept the lunch menu separate from the dinner menu. They took off some things that were really good and the only items my wife would eat. Now it cost 50-60 dollars for lunch! That’s a bit steep for to me ( for lunch). I wouldn’t pay for a thing if it wasn’t perfectly cooked at that price. Agreed, the service at this location is sub par and the management even worse. My wife and I dined again at Le Cellier recently, as it had been years since our last visit and were appalled at how low the standards for service appear to be at this “signature location: In the lobby, the staff simply ignored the sitting customers and talked amongst themselves (is this not Walt Disney World? ); When we finally received a table, our server seemed more interested in pressing us to try the wine than attempting to make us feel welcome; round three was the meal, which, while quite good (wife had the filet, I had the rib eye), did not make up for the fact that we felt like cattle that was being rushed through so that the next herd could come through; to top it off, we were finishing our meals when we witnessed what appeared to be a manager arguing with another employee at the restaurant in front of customers! Now, my wife and I have dined at most of the restaurants around the World Showcase as well as in the other parks and this has been our worst customer service experience. It could have been a bad day at Le Cellier, however when the cheque comes to over $150 for two people, it should not ever be expected. As we were leaving, we wanted to speak to a manager, but when we asked the young lady at reception for one , we were made to wait for over ten minutes. Finally, we wanted to make it to Hollywood Studios, so we left. I would not return to this location, the price is steep and the service as well as the management are lacking. Went to Le Cellier for 2 weeks ago. Service was extremely slow. Food was average at Best. Caesar Salad was flavorless. My wife ordered the Mushroom Ravioli which was loaded with Salt and I ordered the Filet, which paled in comparison to the Yachtsmans Steakhouse Filet. Do yourself a favor and take the extra 100 steps or so out the International Gate to the Yachtsmans Steakhouse for a 100% more enjoyable dinner. Le Cellier was the worst dinner we had in Disney. Wow there’s a lot of hate for Le Cellier! I have eaten here twice (and going back again February 2015) and have had AWESOME meals and service every time! The cheese soup is delicious, the wild mushroom filet is fantastic (and I HATE mushrooms!) 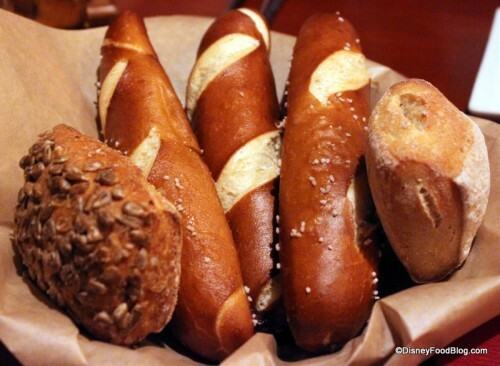 and the pretzel bread….ohhh that pretzel bread! So so good when you dip it into the cheese soup (ok now my mouth is watering). The only thing I would say isn’t worth getting are the desserts. I would save your money and go somewhere else for that but everything else was great! I’m taking my boyfriend here (his 1st time) in about 50 days and i’m so excited for him to experience it! I think the hatred for Le Cellier started when they decided to take the lunch menu away. Some of the items on that menu were very good and more friendly towards picky eaters. The mac and cheese didm;t have lobster in it and didn’t cost $20. My wife doesn’t like seafood so the mac and cheese were out for her. The also had a great burger made from their own steaks, but that is gone as well. It’s never been a cheap place to eat ( what place is at Disney?) The dinner menu is very expensive, but to charge that kind of money for lunch is ridiculous and only greed could be at the heart of that matter. I know when I talked to customer service reps at Disney they said there was a significant drop off in its popularity at lunch time at Le Cellier. Hopefully they will rethink this and go back to a lunch menu in the afternoon. The steaks are WAY better at the Yachtsman Steak House anyway. No one, no matter how much money they have, wants to spend $75 – $100 per person for lunch. Filet and 2 Ribeye’s. The quality of the beef was terrible. Tough, hard to cut. The wild mushroom risotto that came with the filet was not good at all. Service was good , quality of food they were serving, was embarrassing for the price. If you want a great steak, go to Shula’s at the Dolphin. We’ve had many amazing dinners at various Disney restaurants, and had our first at Le Cellier this year. It was fantastic! We started with the charcuterie which was exceptional. My husband had the bison which was so good it was shameful, and I thoroughly enjoyed the filet. Both, cooked to perfection. 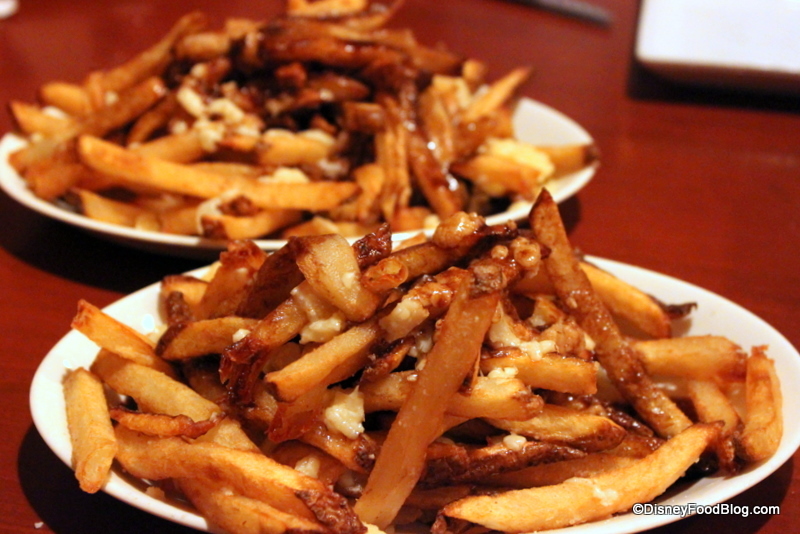 We shared the poutine, which was sinful, all with a great bottle of Iron Horse Pinot Noir. As full as we were, we moved on to maple creme brûlée with the dessert wine flight. The food and service were on point and after we ventured to the gift shop to purchase a bottle of the Ice Wine to take home. Can’t wait to go back…. Already made a reservation!